My mind is currently being blown by this Bananas Beautiful Etsy shop, Electric Marigold. It has all the necessary ingredients, wrapped up in one perfectly styled package. 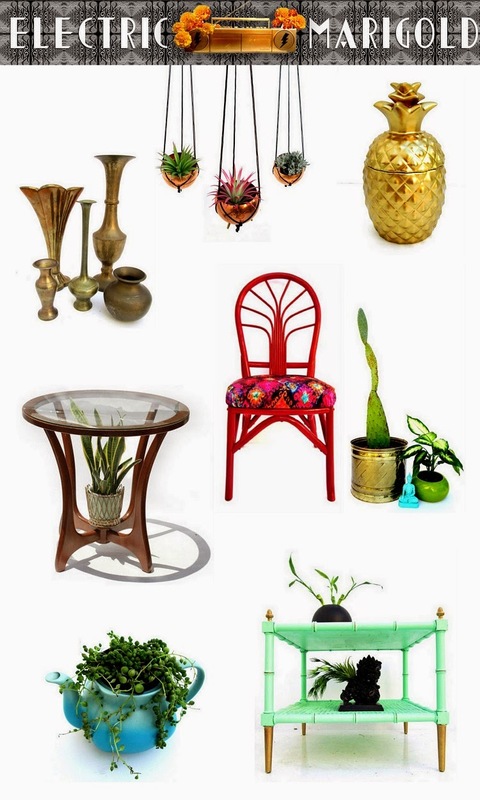 Vintage mid-century, regency, beaucoup rattan, brass and plantiness, vibrant colors, all with mad modern boho flava. The OOAK shop is run by an interior designer/long time friend duo out of Los Angeles with a passion for set staging, vintage revival and helping people love their space. They even do custom pieces, personal shopping and will help you hunt down that elusive vintage item you've been searching for. These ladies Bring. The. Funk. Oh my stars, it's so good. (I'm bringing back "oh my stars" btw - watch and see) Not only do they make me want every single item, but their arrangements and creativity have me bubbling with inspiration for my own space and vintage collecting. If you're in the market for unique vintage furniture pieces and collectibles, fab bar-ware or just general gorgeousness- check out the shop here. Props Stephanie & Leah. Props. great shop - cool stuff! PLEASE bring back "Oh my stars"! It makes me smile! Oh, and your right, awesome shop!